A landmark of the Cockle Bay promenade, Nick’s Seafood Restaurant ‘sea to plate’ philosophy showcases the superb flavours of Australian seafood. Renowned for the quality of its locally sourced produce. 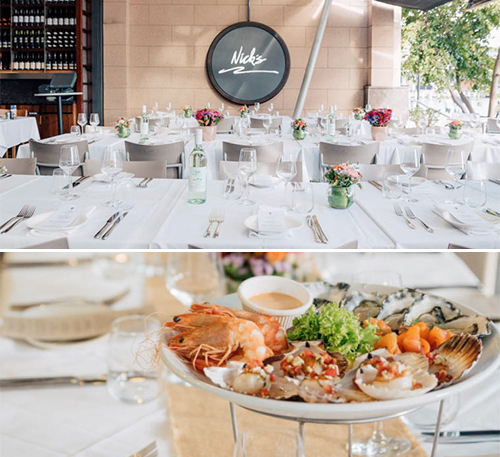 Set over a grand, elegant dining room and spectacular harbourfront alfresco deck, Nick’s commanding views of the harbour are the perfect complement to its stunning meals. With a dedicated events team able to tailor a private function to suit any size or special requirements, the restaurant seats close to 480 people. Nick’s can accommodate a cocktail event of up to 1,200, offering the possibility of a gala celebration in one of the largest and most decadent harbourside locales in Sydney. Nick’s elegantly contemporary semi-private dining area holds 40 people sit down and 80 in a cocktail setting.